A C-17 Globemaster III from Travis Air Force Base, Calif., sits in a paint barn hangar for paint touch-ups Aug. 6, 2018, at Joint Base Lewis-McChord, Wash. California laws prevent Travis Airmen from spray-painting their C-17s, so they brought it to McChord where it is allowed. 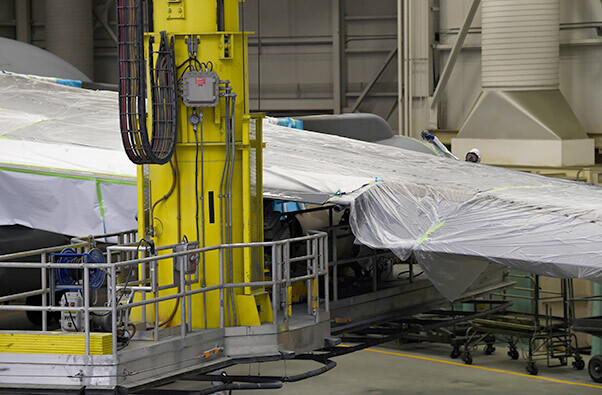 Renewing a paint job may not seem like an important task to some, but for aircraft it can be the difference between continuing to fly and being decommissioned. 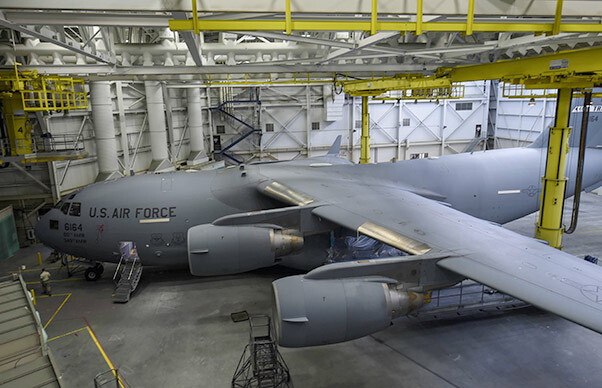 For the 60th Maintenance Squadron from Travis Air Force Base, Calif., they are unable to spray paint to renew their C-17s’ paint and have to roll the paint onto the aircraft. Airmen at McChord Field are able to spray paint and are working toward building a partnership with Travis AFB, and other C-17 bases, to use McChord facilities to meet this requirement. Travis Airmen visited McChord to use their paint barn for the first time from July 31 to Aug. 9, as it takes about ten days to prepare and paint the jet while providing enough time for the paint to cure. Staff Sgt. Fernando Ortiz, 60th Maintenance Squadron aircraft structure maintenance technician, paints the inside of a C-17 Globemaster III from Travis Air Force Base, Calif., Aug. 6, 2018, at Joint Base Lewis-McChord, Wash. Painting aircrafts is a large part of corrosion prevention that help maintain the longevity of the jets. 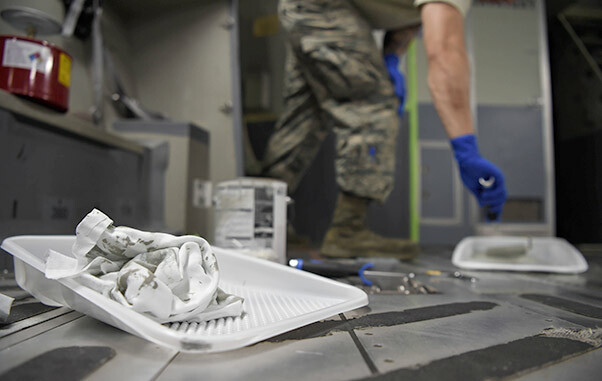 With McChord’s paint barn being a step above what most AMC bases have, and the need for other bases to paint their C-17s, McChord is sharing their facilities. The increase in traffic also helps further justify the needed paint barn upgrades. The paint on the C-17 protects the aircraft from water entrapment, provides ultraviolet protection, aids in fuel efficiency and, most importantly, is a form of corrosion control. 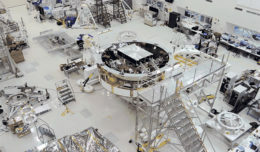 Without the paint as a protective layer, the metal components, such as the panels, hinges, rivets, etc., would be eaten away by rust and potentially fall off. Spraying is much more effective in bonding the paint to the metal versus rolling it on, and can provide protection for a longer amount of time. Tech. Sgt. Salvador Ynostraza, left, and Staff Sgt. Adrian Catalan, both 60th Maintenance Squadron aircraft structural maintenance technicians, maneuver a platform under the wing of a C-17 Globemaster III from Travis Air Force Base, Calif., Aug. 6, 2018, at Joint Base Lewis-McChord, Wash. Ynostraza and Catalan were part of a Travis crew sent to McChord to spray paint their C-17 in McChord’s paint barn. Because the 60th MXS does not have the permission or ability to spray-paint their C-17s, the Airmen stationed at Travis then do not have the means to train on how to use the spray paint equipment or prepare the jet for the process. Collaborating with the 62nd MXS to paint their C-17s at McChord Field provides their Airmen with the opportunity to learn those skill sets, making them better qualified Airmen. This is Travis’ first trip to McChord for this purpose, and is a test to see how everything will go and if it will be a viable option to meet future needs. Staff Sgt. Cody Lange, 60th Maintenance Squadron aircraft structural maintenance technician, prepares to spray paint onto the wing of a C-17 Globemaster III from Travis Air Force Base, Calif., Aug. 6, 2018, at Joint Base Lewis-McChord, Wash. Lange, among other Travis Airmen, flew their C-17 to McChord Field to use the paint barn at the base. 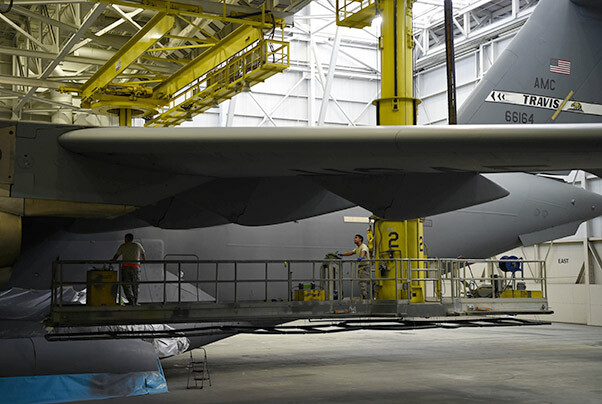 The ultimate plan is to have multiple bases using McChord’s paint barn to maintain their C-17s. Every base is like a wheel or cog in the engine that is the Air Force. It is when they work together that the Air Force can be most efficient and achieve its goals. McChord is working on building a new partnership with all of the bases in its command that will help extend the life of one of their vital assets to better the Air Force for everyone involved. Staff Sgt. Cody Lange, 60th Maintenance Squadron aircraft structural maintenance technician, applies masking tape to certain areas before painting the inside of a C-17 Globemaster III from Travis Air Force Base, Calif., Aug. 6, 2018, at Joint Base Lewis-McChord, Wash. Travis and McChord Airmen are trying to build a partnership where Travis C-17s are painted in McChord’s paint barn.